Babies are adorable to play with when they are like tiny bundles of giggles and smiles. However, as they are very new to this world, they cannot exercise motion control or urination. So a mother carrying her newborn often gets her clothes soiled and wet, all thanks to her little one. But today we are blessed with diapers that can soak the wetness caused due to your baby's urination and keep you and your baby from the uneasiness. However, with frequent use of diapers, your baby's soft and sensitive skin may be prone to diaper rashes. Generally, they are not too harmful and goes away on its own. But if the rashes become severe, your baby may experience itchiness and discomfort which may leave the little one feeling uneasy and restless. There are several solutions to cure diaper rashes in infants. 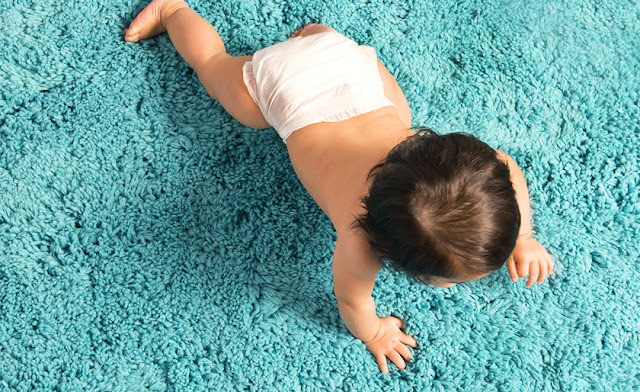 Read on how you can relieve your baby from diaper rashes. This is a rule of thumb when you notice the red rashes on your baby's bum. Pat dry the bottom and then apply a prescribed cream around the affected area. Do not apply on the open skin as it may further slow down the healing process. Once the rashes have disappeared, use a gentle talcum powder to keep the bottom dry. A well-feeding baby until the age of one will pee frequently. So you need to have constant vigilance and change your little one's diaper every 3 to 5 hours. During the first few months of life, you may have to change 20 to 24 diapers within a 24-hour period. Do not use regular towels to wipe your baby's bottom. No matter how soft they are for us, it may still be hard on your baby's delicate skin. Use a thing soft muslin that is clean and sanitized. While washing your baby's clothes, use a mild antiseptic for a final rinse to ensure that their pants and tops or jumpers are disinfected. Avoid the use of any synthetic materials on your child's body. Ensure that all the baby clothes your little one wears are 100% cotton. Do not use plastic pants till the rashes have completely healed. If your newborn is ready for a bath, use a teaspoon of baking soda in the bath water. Soaking the affected area in baking soda will help quicken the healing process. For babies under a year, try to use a diaper only during its sleep times for an uninterrupted slumber. During the waking hours, try using a soft muslin or cotton brief that is big and airy. Avoid using tight pants and let the affected area get enough air for drying up. This may be a tiring job, but as a caregiver nurturing your little one, you have to be on the constant lookout for a soiled diaper and change it immediately and wipe the area with clean water and then pat the affected area dry. Soiled and wet diapers are the primary reasons for diaper rashes. So till the rashes heal and even after that you have to be on a constant watch. All these may exhaust you, but watching your little one find relief is worth all the effort. And remember, all this is just for the first few years. Once your baby grows up, you will miss these days of tiring motherhood. So enjoy everything, no matter how tiring and stressful it is. Such a common problem faced by babies. Thanks for the tips kriti! I had taken care of rashes with these tips suggested by my mother in law. Hope it is helpful for new moms.